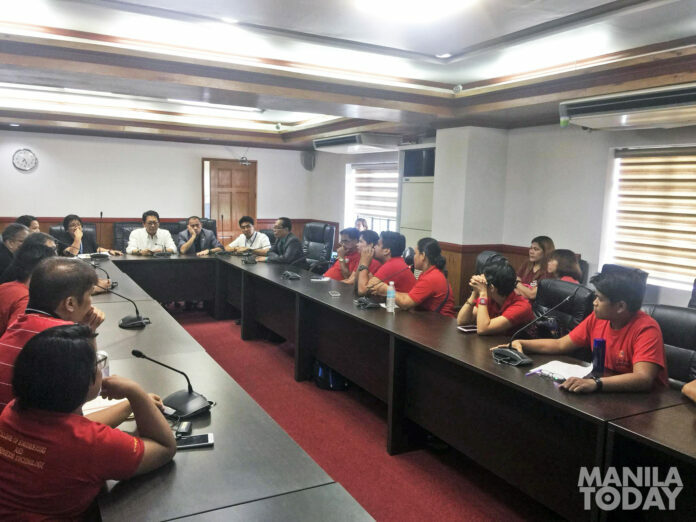 PLDT workers and supervisors faced Department of Labor and Employment (DOLE) Secretary Silvestre Bello III, Undersecretary Joel Maglunsod and representatives of DOLE-NCR in a dialogue on the morning of July 31. Today is the deadline given by DOLE to PLDT to regularize thousands of its workers, but the telecommunication giant has yet to comply with the order. Officials of the PLDT Organization of Workers and Employees for Rights (POWER), PLDT rank-and-file union Mangggawa ng Komunikasyon sa Pilipinas (MKP) and supervisory union Gabay ng Unyon sa Telekomunikasyon ng mga Superbisor (GUTS) joined the conference at the head office of the Labor Department in Intramuros, Manila. While the conference was ongoing, a picket protest was held at POWER’s “Countdown to Regularization Camp.” Terminated PLDT contractual workers from SPI Manila, Curo Technika and MG Exeo in Batangas and Laguna joined the rally calling on labor officials to enforce their rulings on the Pangilinan-owned. DOLE released a compliance order for PLDT to immediately regularize its more than 12,000 contractual employees. These workers, however, were left jobless after the said company terminated its service contracts with the manpower agencies last June 30, 2018. “As Secretary Bello gave PLDT an ultimatum until today to implement his order, we expect the agency to show political will to impose substantial and decisive moves today for us to be immediately reinstated and become regular PLDT workers starting tomorrow,” said Dan Joshua Nazario, president of POWER. Members of POWER aired frustrations over the failure of DOLE to push for the regularization of PLDT contractual workers despite the agency’s self-imposed ultimatum today. They said that they got nothing significant from the dialogue except a new set of promises from the government labor agency. According to the group, instead of decisively implementing its own compliance order, DOLE aired out its next moves of pushing for the garnishment of PLDT and filing of contempt charges against the telecom company. Some of the issues raised by DOLE includes money claims and cash bonds, financial assistance among others. DOLE even admitted that the battle for regularization of PLDT workers is still on a “waiting game” stage. Nazario vowed to continue their struggle for regularization until their first day as regular employees inside PLDT. The group said that the response today will not stop them from fighting all forms of contractualization in the country. Officials of POWER said that after their mandatory conference and protest rally last July 11, Secretary Bello issued a clarificatory order that reiterated its prior compliance order and gave PLDT until end of July to comply to its ruling. Nazario said that they have been keenly waiting for DOLE to take-up actions to compel PLDT to abide by its own order. POWER also urged the PLDT management to break its silence and stop bragging on its ‘intake 4-steps process’ as its effort to regularize its workers. The group cited that provisions on the DOLE’s compliance and clarificatory orders were clear enough to be able to implement a smooth transition for regularization to be completed. The group said that the ‘4-steps process’ of re-application is a way for PLDT to circumvent DOLE ruling and shows that PLDT is not really serious in pushing for their regularization. “DOLE must prove to us that as a government agency, it is more powerful than PLDT. [Bello] can only show this if he will not bow down to PLDT and will impose stricter sanctions against the telecom company in the soonest possible time if it will remain firm in doing nothing on our regularization,” said Nazario.